In finance and investing the term portfolio refers to the collection of assets one owns. Compared to just holding a single asset at a time a portfolio has a number of potential benefits. A universe of asset holdings within the portfolio gives a greater access to potentially favorable trends across markets. At the same time the expected risk and return of the overall holding is subject to its specific composition. 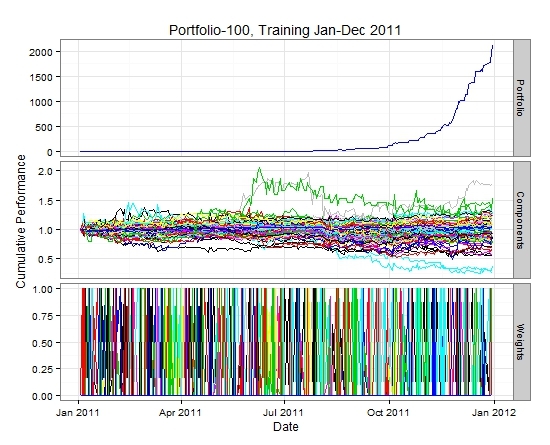 A previous post on this blog illustrated a portfolio selection methodology that screens a universe of possible assets. The object there was to find a particular combination that reduces the expected risk-return ratio (sharp-ratio). The assumption there was an underlying buy-and-hold strategy, that once a particular portfolio is selected its composition is hold static until the final position unwound. This post concerns with dynamic portfolio trading strategies where the portfolio is periodically rebalanced. At prescribed intervals the composition of the portfolio is changed by selling out existing holdings and buying new assets. Typically it is assumed that reallocation does not change the overall portfolio value, with the possible exception of losses due to transaction costs and fees. Another classification concerning this type of strategies is if borrowings are allowed (long-short portfolio) or if all relative portfolio weights are restricted to be positive (long-only portfolio). Following closely recent publications by Steven Hoi and Bin Li we first set the stage by illustrating fundamental portfolio mechanics and then detailing their passive aggressive mean reversion strategy. 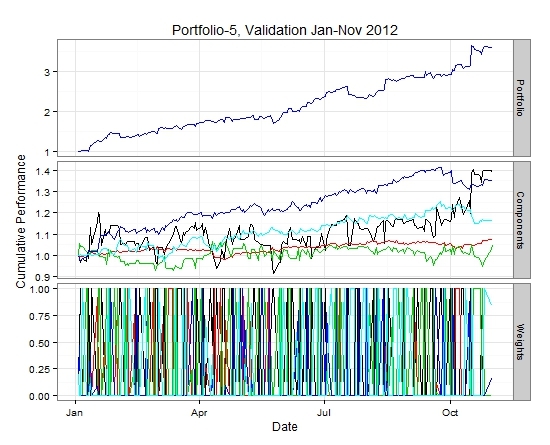 We test drive the model in R and test it with 1/2011-11/2012 NYSE and NASDAQ daily stock data. 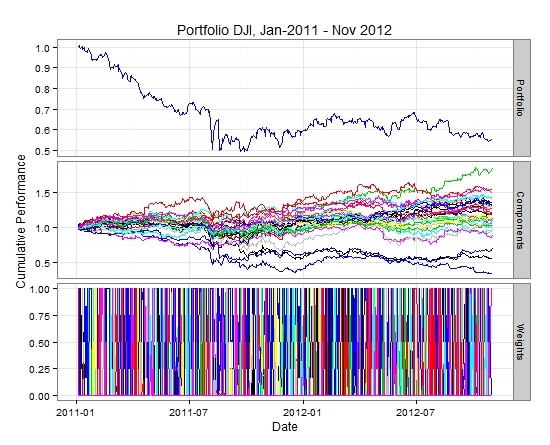 shows the individual relative open to close or close to next day’s close returns. With the benefit of perfect foresight its is possible to allocate all weights into the single asset with highest predicted gain. degree axis. After rotation the angle between the the weight vector and the new performance vectors reduces. This results in an increase of the portfolio return value. generates a flat portfolio in case the performance vector does not change while it increases the portfolio value in the case of an actual mean reversion. The strategy implicitly assumes a price process that rotates between outperforming and lagging components within the portfolio. This does not include the situation where all stocks are out or underperforming at the same time. The long-only portfolio strategy relies on the ability to be able to reallocate funds between winners and losers. The table below shows the result of computing the portfolio weights at the open of day 2 according to above formulas. 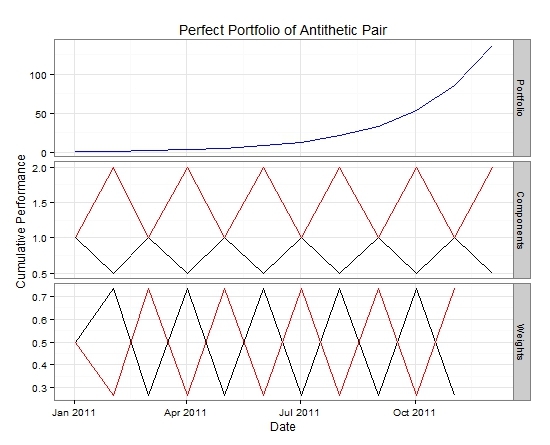 With more than two assets the loss condition together with the normalization is not sufficient to uniquely determine the portfolio weights. The additional degrees of freedoms can be used to allow the posing of additional criteria one wishes the strategy to observe. A good choice seems to be requiring that the new portfolio weights are close to the previous selection, as this should minimize rebalance transaction costs. 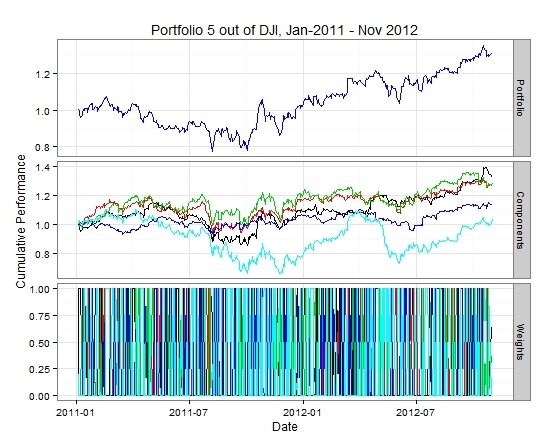 As a benchmark I like always to testing against a portfolio of DJI member stocks using recent 2011 history. The strategy does not do very well for this selection of stocks and recent time frame. As an enhancement screening stocks by ranking according to their most negative single one-day auto-correlation. The 5 best ranked candidates out of the DJI picked this way are “TRV”,XOM”,”CVX”,PG” and “JPM” . Rerunning the strategy on the sub portfolio of these five stocks gives a somewhat better performance. Next a screening a universe of about 5000 NYSE and NASDAQ stocks for those with the best individual auto-correlation within the 2011 time frame. 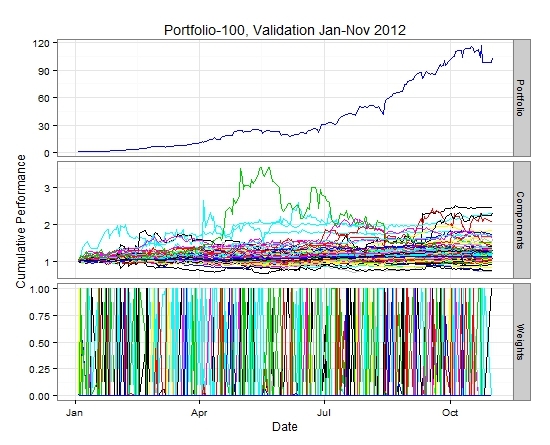 Then running the strategy for 2011 and out of sample in Jan-Nov 2012, with either the 5 or the 100 best names. The constituent portfolio consists of “UBFO”,”TVE”,”GLDC”,”ARI”,”CTBI”. We test drove the passive aggressive trading strategy on recent daily price data. 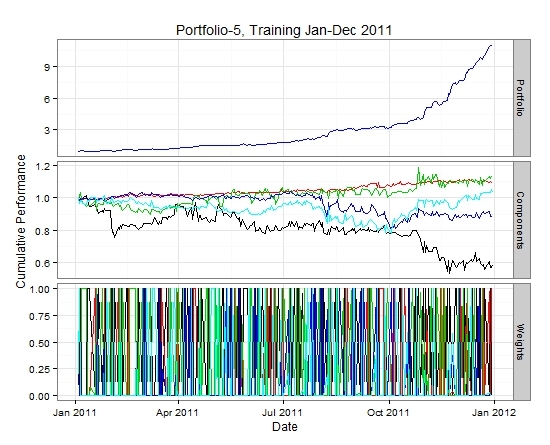 While not doing very well on a mainstream ticker like DJI, pre-screening the stock universe according to a auto-correlation did improve results, even when running the strategy out of sample for the purpose of cross validation. Other extensions, like including a cash asset or allowing for short positions require further investigation. The strategy has interesting elements, such as minimizing the chance in the portfolio weights and the use of a loss function. It does only directly take the immediate one-period lag into account. For use in other time domains, like high frequency, one could consider having a collection of competing trading agents with a range of time lags that filter out the dominate mean reverting mode. There are a verity of approaches in the literature that I like to demonstrate as well in the framework of this blog, stay posted. To leave a comment for the author, please follow the link and comment on their blog: quantsignals » R.